So the tree is sea-like in a couple of ways: it is big, and it does/knows what it wants/is doing. Last edited by airdrik on Wed May 22, 2013 5:20 pm UTC, edited 1 time in total. airdrik wrote: So the tree is sea-like in a couple of ways: it is big, and it does/knows what it wants/is doing. Wait, I think I know why this tree looks different than it did before (during the temporary zoomout). 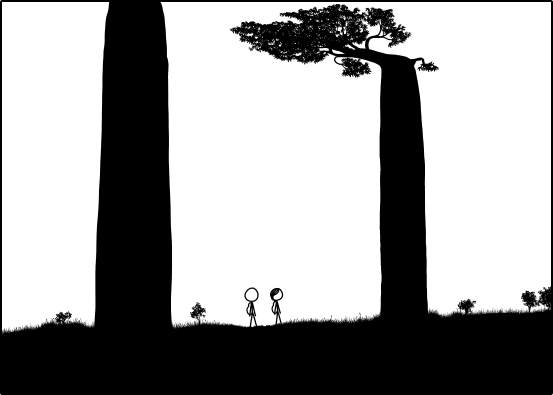 It's drawn all funny to show us their perspective of the tree, because a tree looks very different when viewed up close as opposed to far away. The top of the tree (from the point where it bends to the top) is skewed to the left, as if it had hit an invisible cieling but had kept growing after bending 90°, or if it were a wall poster that's taller than the wall and has the top part pressed flat against the ceiling. Actually, this tree wasn't present in the temporary zoomout, this is the 2nd tree that they've passed since passing the two shown in the zoomout. ETA: However your comparison of this tree to those first two may be correct. My initial thought was that it was a 2D slice of the tree and there are other limbs not shown that would produce a full canopy. Of course Megan's comment disproved that. Last edited by airdrik on Wed May 22, 2013 5:29 pm UTC, edited 1 time in total. Hmmm. Only two trees were shown in the zoom out. I think this is the third tree. Track their movement since about np1500. Last edited by charlie_grumbles on Wed May 22, 2013 5:34 pm UTC, edited 1 time in total. Hmm, a cake that probably doesn't taste very good? Yeah, that seems about right. 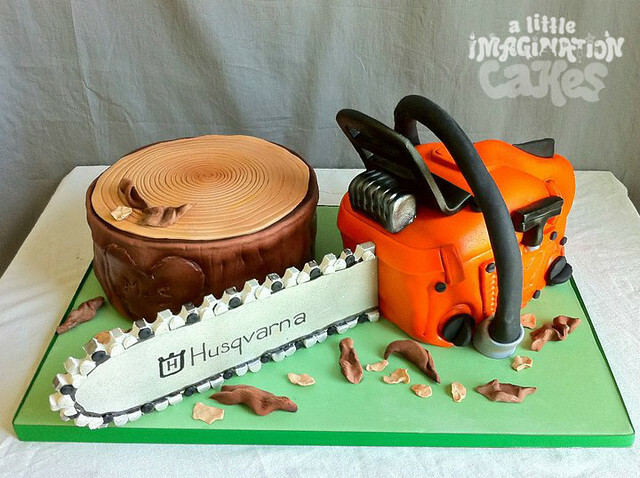 Well, I also have a chainsaw made of Chocolate fudge. and a saw made of chains. the chains are made of tiny hacksaws, interlinked. It is as dangerous to the wielder as to the person it is used against. And besides, what heresy has the tree8 committed that it would deserve such a punishment of the high inquisitor? If it has committed any heresy (which even to suggest that it has committed heresy is heresy as it was placed there by the GLR himself and as such cannot commit heresy), certainly it deserves a more fitting punishment: a careful removal of its fruits to be distributed to the followers of the OTC and OTT. Only 77 more to go to get to a nice round number! Last edited by airdrik on Wed May 22, 2013 5:38 pm UTC, edited 1 time in total. No, the use of a chainsaw against a tree would be purely a matter of self defense. or a need for mahogany furniture. 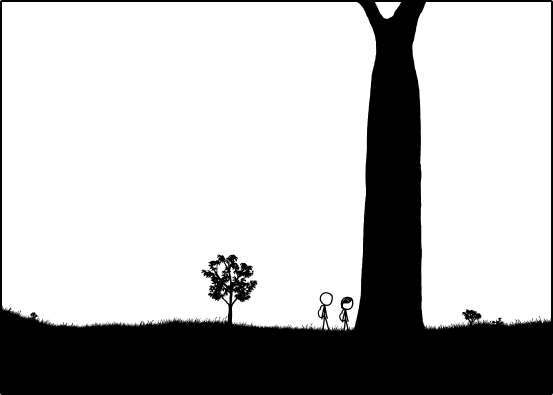 My other big issue with this idea is that Randall knows how to draw a tree that grew sideways for some reason. This tree9,10, as others have pointed out, looks blatantly photoshopped/skewed. Last edited by astrocub on Wed May 22, 2013 5:42 pm UTC, edited 1 time in total. SBN wrote: Apologies, I'm very slow at enhancing, and not very skilled, but I've found something. What if the trees are entwives? As anagram posts go, that's about as good as you're ever likely to get from me. I'm better at solving them than creating them. StratPlayer wrote: If you give a baby a cuban cigar, I'm pretty sure a lot of people will intentionally glare at you. And it might even get captured in a glare-free flash photo. Wait, did Laura Numeroff even write that book? I think you're making that up! Just like this: If you lead a Cueball to a bent Ent, he'll probably say something silly. Last edited by rmcurtis on Wed May 22, 2013 5:57 pm UTC, edited 1 time in total. Dracomax wrote: It may be way bigger than me, but based upon my experience with trees, I'm almost certainly much, much faster. and I have opposable thumbs. and a chainsaw. Thank you Dracomax for that line which is looking very sig-able. However, as a fellow chainsaw (ab)user (thankfully still with opposable thumbs), I feel that I must identify that there are often trees that do move very fast, these are always the ones that have been attacked by said chainsaw and luckily (but sadly not reliably) always away from said chainsaw wielder. I see this as a meta-commentary about the OTC and possibly also the OTT. Randall is humoring us once again. I love (and wait for) it. "This OTC/OTT seems to be getting out of hand, is it supposed to be like that?" "The OTC/OTT is pretty big. It probably knows what it's doing." Last edited by Kieryn on Wed May 22, 2013 6:25 pm UTC, edited 1 time in total. I'm not sure you need to lead Cueball anywhere for him to say something silly. That is why we love him. That, and his gorgeous head of hair. This suggest that perhaps Megan and Cueball are children. 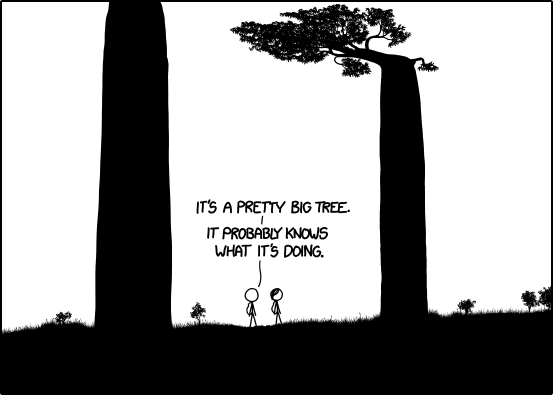 Older than La Petite, but still young enough to think that grownups have all the answers, so, it something is big (like sea¹ or crooked Baobab⁸), it must know what it's doing. Last edited by mscha on Wed May 22, 2013 6:46 pm UTC, edited 2 times in total. the Ent with a head that bent. I saw intent for the saws! Last edited by StratPlayer on Wed May 22, 2013 6:31 pm UTC, edited 1 time in total. Last edited by astrocub on Wed May 22, 2013 6:36 pm UTC, edited 1 time in total. Edit: Also, when I quote you, like this, I lose your footnotes.